Where to put a comma? Recent expulsion of the neo-nazi domain DailyStormer from Google made news. The unusually high ranking that the DailyStormer website enjoyed in Google Search before this news completely escaped coverage. The following screenshot shows Google search results for Allum Bokhari (performed on August 10, 2017 in Anaheim, California, using the clean browser configuration; no prior search for the term from the same IP). 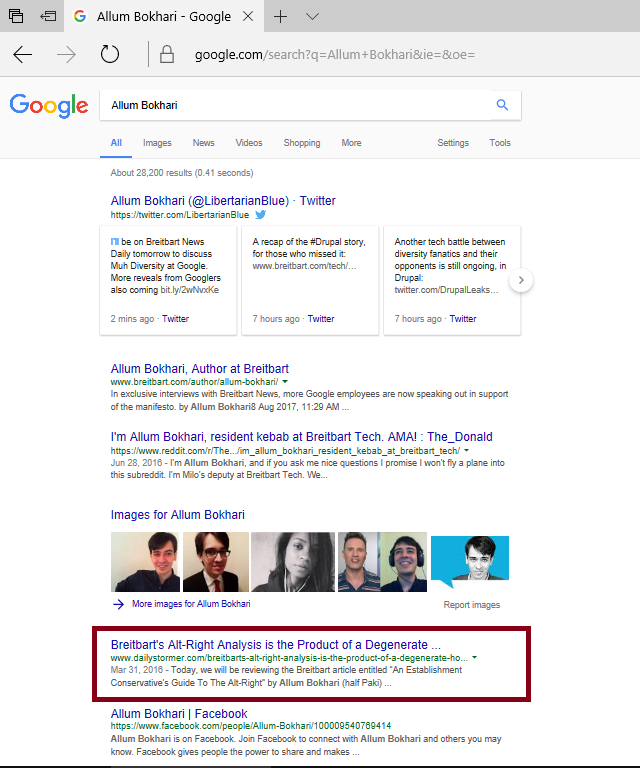 Allum Bokhari is a prolific writer and a reporter that launched Rebels of Google on Breitbart – a series of interviews with Google employees that leave unflattering image of the Silicon Valley giant. As you can see, the DailyStormer link is the fourth text link on the first page, and possibly the most prominent one. Besides hateful content on the linked page, the link creates a false impression that this Libertarian author is somehow connected to the DailyStormer. This is probably not a vendetta by Google but an effect of excessive coverage of the DailyStormer by the formerly mainstream media. Websites that provided the DailyStormer with most link equity (other than Reddit) are CNN, HuffingtonPost, NPR, Washington Post, and LA Times. This case illustrates one of the worst falsehoods of the modern fakestream media and its associates: they hate normal conservatives and all anti-Left people and do everything they can to hide their existence from naive audiences. The FSM conceals or excuses the left extremists while eagerly pushing forward a small group of religious nuts and a few neo-nazis. A median CNN viewer might be led to think that there is an ideological no-man land between John McCain and Richard Spencer, between RINOs and neo-nazis. Trump is far from being a RINO, so it is easy for FSM to paint him as encouraging neo-nazis — facts be damned (as usual for FSM).